When I was a primary school teacher I did a Graduate Diploma in Reading/Language Education to add a fourth year to my qualifications. By this time, my passion for children’s literature and literacy education had taken a firm hold, and it was no surprise that my major project for my final semester was titled: Literacy through Literature. This was, and always will be, my thing with literacy education – using quality literature not only to instil a love of books and reading, but also to develop reading and writing skills. The last few months have been spent visiting schools as a visiting author and I have been gladdened to see the notions of “mentor texts” and “reading like a writer” being actively implemented in many classrooms. These notions have been something that I have incorporated in my teaching for almost four decades now (yikes! – I must be really old), as a classroom teacher, a learning support teacher, a writing teacher and now as a visiting author giving workshops to students. I think it is such a powerful tool for literacy education. 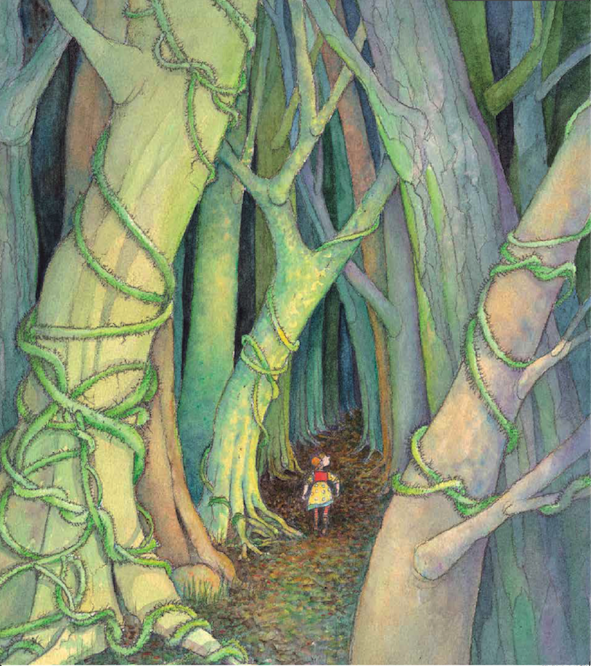 Picture books, I believe, are particularly useful as mentor texts. Picture books take a big story or idea and distil it to its bare bones. And because of this they pack in an awful lot, in very few words, which means they can provide some great models and insights into language use, writing techniques and story structure, all in a bite-sized chunk of text. That’s a win-win for any busy classroom. My aim with Beware the Deep Dark Forest was to write a robust story with lots of juicy language and I have to say that I had so much fun with it. (Possibly too much!) 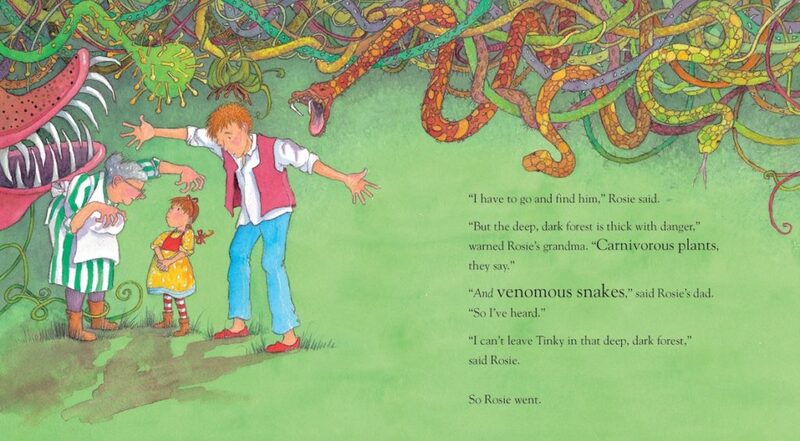 My favourite comment so far about the book was from a mum of a four-year-old, who wrote “It’s all carnivorous plants and venomous snakes round here at the moment!” That was received with a fist-pumping, Yes! from me. Strong verbs: trudged / squeezed / skittered / toppled / squelched etc. 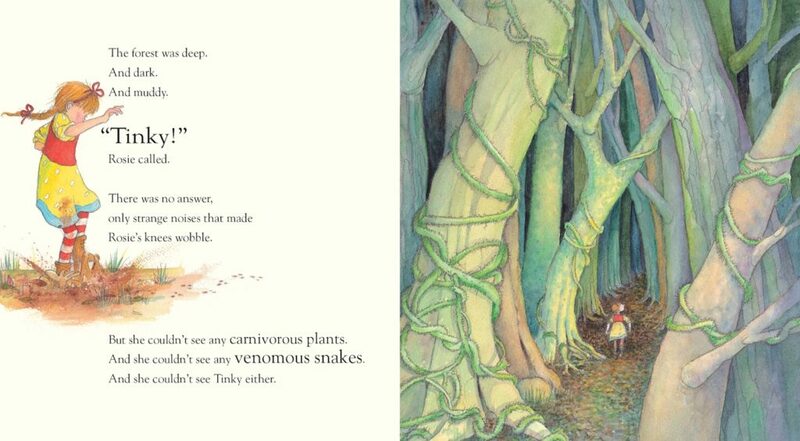 Juicy vocab: carnivorous plants / venomous snakes / ravine / menacing / bristly /googly etc. Beware the Deep Dark Forest is an example of a quest story – a hero’s journey. Because the story has been reduced to less than 600 words the “bones” of the story are quite exposed – and because the bones are exposed, the skeleton or framework or structure of the story is more obvious than in a longer and more complex work. This provides an easy access model for teaching narrative structure – in particular, quest stories. Kids love quest stories. They have a strong structure to support young writers as well as much to engage active imaginations! Quest stories involve a character or characters being called to action to go on a quest to find something or solve a situation of great importance. Quests also involve a journey through strange and dangerous lands where the character will be faced with a number of obstacles that must be overcome in order to reach his/her goal. These all lead to the final showdown and, once successful, the return trip home. You could start with using the structure of Beware the Deep Dark Forest directly in an “innovation on text” type activity. Perhaps Beware the Deep Dark Ocean or Beware the Long Hot Desert or Beware the Busy Bustling City. The structure of the story remains, only the character, purpose, setting and obstacles change. Next you could have the students create their own quest narratives. The planning could revolve around answering the above questions but with students using their own ideas. I suggest spending a bit of time on developing the character, in particular the character’s motivation for going on the quest, and also some sensory and specific details about the setting. These all help to lift the telling. I usually limit the obstacles to three – just so the story doesn’t become to unwieldy. For those inclined, creating a “quest map” can help students visualise the story and keep it focused. Once the students have worked through their basic plans, I then ask them to think about how the story will start. What kicks off the story? What changes in the character’s life? How can you make your opening sizzle? Then it is time to go QUESTING! PS: Here is a link to some Teachers’ Notes prepared by Walker Books Australia. Thanks Dimity! That’s what I hope. What a rich and rare offering this is, Sue. It will be of benefit to readers, educators and writers everywhere. Thank you. Thanks, Sue! I hope educators will find it useful. I am having a lot of fun with this book at the moment! Great teacher notes. How fun going on a quest. Thanks, Maria. Kids love quest stories! They are exciting but also have a strong structure to work from.